Hello crafty chickas! 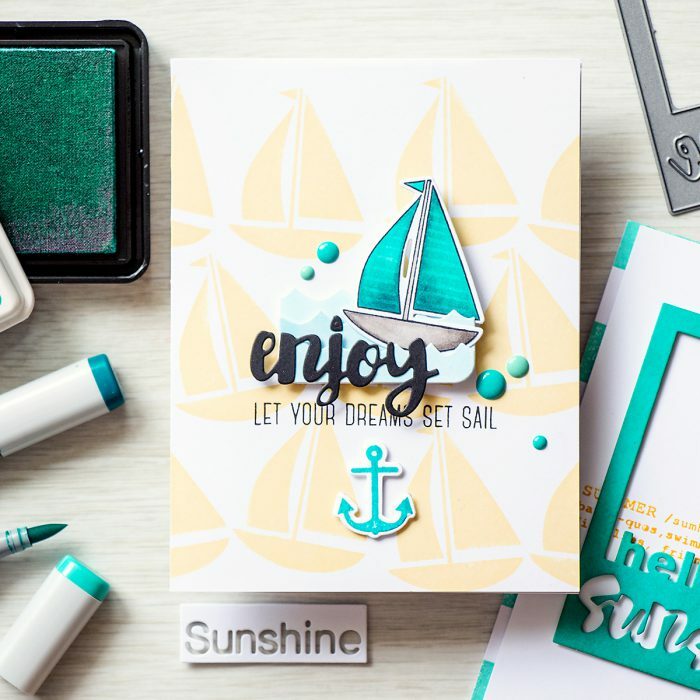 I’m back with another card using new goodies from Simon’s Splash of Color release. Loving it! I’ve already shared one project on my blog, you can check it out here and I have lots more to show you over the next couple of days (or weeks as time permits) so stay tuned! If you’ve been reading my blog and watching my videos for some time now you might have noticed I love to make my own backgrounds on cards and this card is no different. 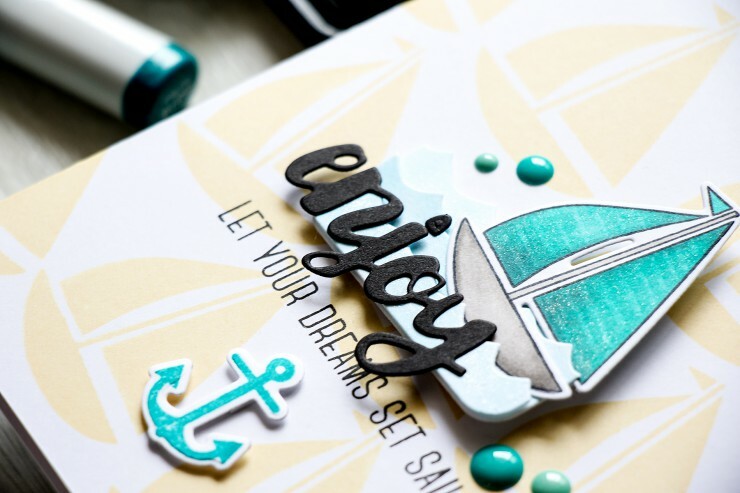 I used a boat stamp from the Sail Away set and stamped several boats repeatedly onto my white card base using Duckling ink. I didn’t alight or measure anything as I waned to make it look like these were floating in the water. Hence every boat is tilted to the right or to the left a bit. I also die cut 3 little waves and colored each using a very light blue Copic Marker. I didn’t have the right shade of blue on hand, so had to improvise. I also coated each with a bit of glitter using Wink Of Stella Glitter pen, you can barely see it there but it adds a nice touch. 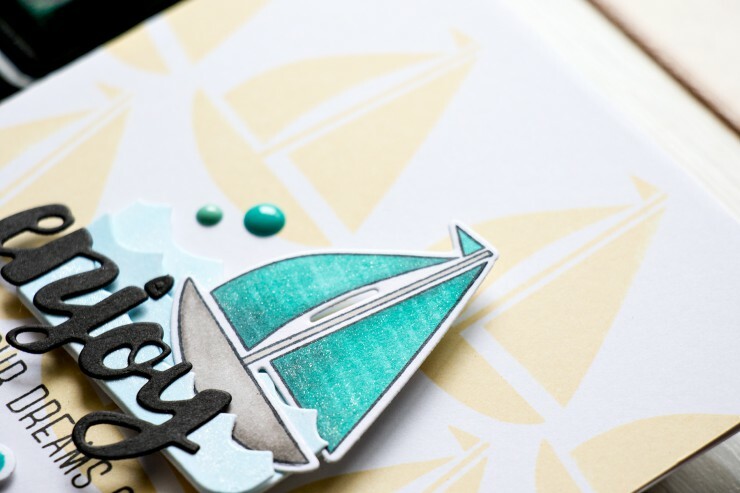 Since I already had boats and waves I just had to stamp and cut a little anchor for this card. I used Scuba ink and foam mounted it directly onto my background. 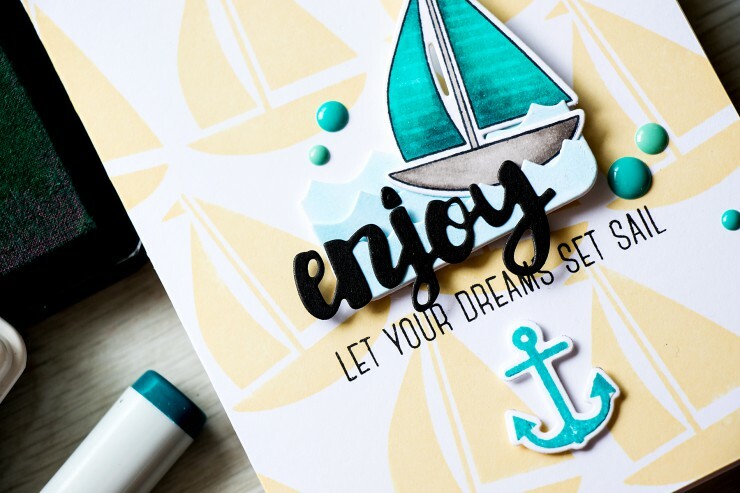 I also stamped one more boat image using Memento Tuxedo Black ink and colored it using Copics. I used a Colorless Blender to add horizontal lines to the sails. I just love the result! I would have never thought it would look this cool! Of course I also added some glitter and adhered my boat in between the waves. I also die cut a beautiful painted Enjoy out of black cardstock and stamped an additional sentiment onto this card using Versa Fine Onyx Black ink. 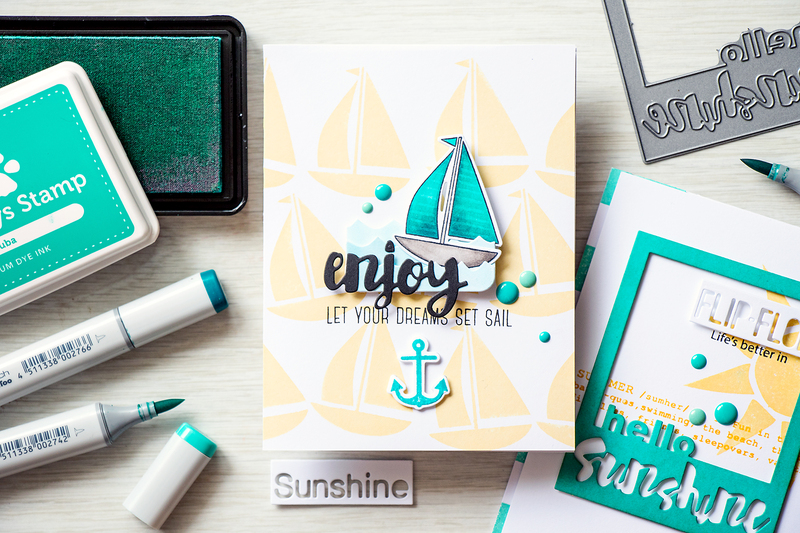 Finally I dressed up this one layer card using several teal enamel dots. 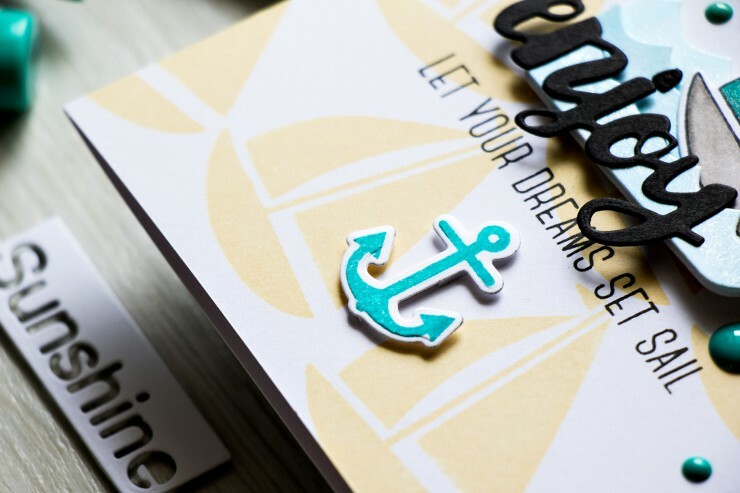 So there you have it – Let your dreams set sail! Gorgeous card! Love the soft background and how it plays with other happy and bright elements!